On 1 June 2011 the FAA announced that it will now use a rule originally used against someone on board the aircraft who interfered with a flight crew, and apply it to people on the ground who deliberately point lasers at aircraft. 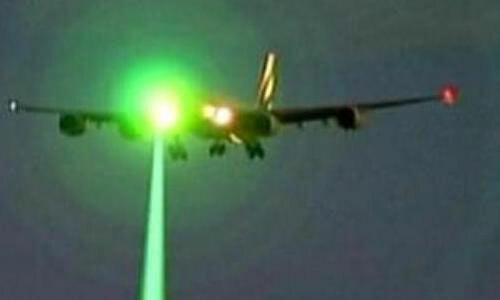 With this change, someone who points a laser at an aircraft can be fined up to $11,000. While this threat to aircraft has not resulted in a major accident, flashing a laser at an aircraft could compromise aviation safety by distracting or incapacitating pilots during critical phases of flight. The FAA published a 2003 study that the effects of laser exposure may be serious for some pilots. Two years later, in 2005, the FAA published an Advisory Circular (AC-70-2) that provided guidance to air crews for reporting laser incidents. Since 2005, the number of reported incidents has grown from 300 in 2005 to over 2,800 in 2010. Many of these events last year were reported near major airports, with almost 100 near Chicago's O'Hare airport, and nearly 200 around the four biggest airports in the Los Angeles area. Even with this FAA change in interpreting regulations, pointing a laser at an aircraft will still be a civil rather than a criminal offense, and the FAA will still only have the power to impose fines and won't be able to put perpetrators in prison. It remains to be seen if this change will reduce the risks faced by flight crews and passengers. The program The World Today from the BBC interviewed Dr. Curtis about some the issues associated with pointing lasers at pilots (5:02).